Future History Now is a 501(c)3 non-profit organization committed to creating collaborative art projects with youth facing adversity in under-resourced communities. Based in Annapolis, Maryland and founded in the summer of 2016 by Jeff Huntington and his wife and fellow-artist, Julia Gibb, FHN has created numerous hand-painted, innovative and thought-provoking murals with kids throughout the world. 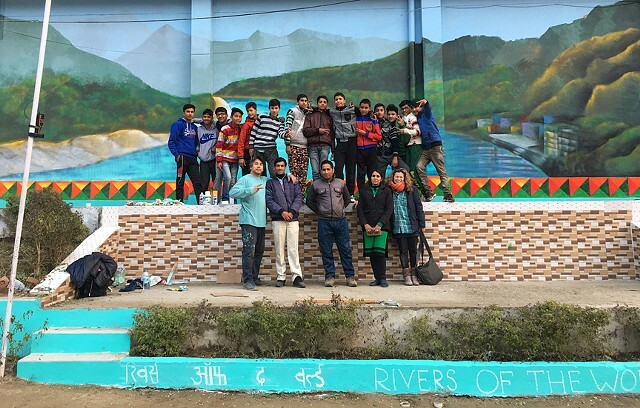 Future History Now + kids of Himalayan English School in front of Ganga mural. Ghansali, Uttarakhand, India, 2018.